As we have seen in my previous essay about “arranged marriage”, there has been a quite drastic shift in the form of marriage from traditional arranged marriage to love marriage in just 70 years. The problem that we should carefully watch is whether people in Japan could smoothly adjust to this rapid change. 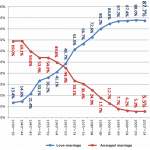 From my personal experiences, there are many not pure “boy/girl-meets-girl/boy” type love-marriages in the high dominance of love marriage as 87.7% in years from 2010 to 2014. It is difficult to know exactly how much is the pure type, because most married couples might be reluctant to tell the truth of their first encounter if it was not a genuine type of love affair. As collateral evidences, some statistics by IBJ, an organization of collected dating services in Japan, are introduced here. The number of the service companies under IBJ is 1,771, and collectively they have more than 59,000 customers. IBJ estimates the number of potential customers (namely the unmarried) as 6 million and the market size as 200 billion JPY ($1.8 billion). The service they offer is practically an Omiai itself. The difference between old and new Omiai is just who takes care of combining unmarried couple: the relatives or some acquaintances (in the past) or a service company (now). In Japan, we call marriage related activities “Konkatsu”, being derived from the word “Shukatsu” (activities trying to get a job). It means that it is quite difficult for many young people to find a good counterpart and they need some special activities. In the past, Gokon, a matchmaking party, was popular as an example of such activities. It seems, however, online dating services operated by the companies under IBJ have replaced Gokon. 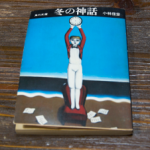 There were some negative images for such services in Japan, since there was a service called Terekura (telephone club) that was often abused for prostitution by amateurs in the late 1980’s. It can be observed, however, that popularization of smartphones and SNS services might have improved the negative image of online dating services at a rapid pace.